Five members and two officials of Afghanistan’s national football team have suffered minor injuries in a bus accident at 6:36pm on Addu City’s link road. Afghan team captain Haroon Fakhruddin Amiri and coach Yousuf Kargar were among the injured. The team was traveling to Herathera Island Resort following its group stage win against Laos in the ongoing Asian Football Confederation (AFC) Challenge Cup this evening. One police officer accompanying the motorcade broke an arm, while a female protocol officer suffered head injuries. Eight others, including two soldiers and two locals also suffered injuries, an AFC media official told Minivan News. Local media said vehicles in the motorcade accompanying the Afghanistan and Laos national teams collided when a local on a motorbike cut in front of the motorcade. Police at the hospital were refusing to give further details at the time of publication. The teams are to fly to capital city Malé tonight, the Football Association of Maldives (FAM) has said. Minister of Youth and Sports Mohamed Maleeh Jamal said the Addu City Regional Hospital has confirmed there are no serious injuries and said the government will continue to monitor the situation closely. Assistant Secetary General of the Football Association of the Maldives (FAM), Mohamed Nasir, said he was deeply saddened by the accident. “Accidents happen. We took all the precautions, security was in place. Police are investigating how a motorcade with sirens met with such an accident,” he said. The 14-kilometer Link Road in Addu City is the longest paved road in the country and is notorious for fatal accidents due to reckless driving. Most recently, a 17-year-old broke his collarbone in an accident on April 7. Addu City journalist and road safety campaigner Amy Jabeen highlighted the lack of traffic police on the link road and expressed hope that the unfortunate accident would raise awareness for better road safety in the city. “We are a city without any traffic police, poor roads and a younger generation with no lane discipline,” said Amy, who has recently held discussions with the city council regarding improvements to local road safety. The last-minute construction of the Addu City football stadium has been marred by allegations of corruption. None of the knockout stage matches or any match in which the Maldivian team was to play has been scheduled in Addu City. The Maldives, Phillipines, Afghanistan, and Palestine have qualified for the semi-finals which will be held in Malé later this week. Speaking to Minivan News prior to the accident, Director of the Maldives national team, Ali Suzain, said the FAM was hopeful that the Maldives team will win the Challenge Cup. “The chances of going to the final is very high now that the Maldives national team has to play against Philippines in the semi-final. Having to play against Philippines is an advantage to Maldives,” Suzain said. The AFC had only noted minor issues such as a supporter entering the football field during the first match and an official from the Kyrgystan national team throwing a water bottle onto the field, Suzain said. The FAM was very pleased with the Maldives Police Service’s oversight of security at the football matches, he added. A Maldivian student, Amir Moosa, 31 from G.A Dhaandhoo was recently killed in a bomb blast in Afghanistan, the Island council has said today. President of the Council Shuaib Abdulla said a family member of the deceased had reported his death in an Afghanistan bomb blast, although the incident is yet to be officially reported to the Council by his immediate family. Shuaib said Amir has been studying in Pakistan for the past six years and many locals believe he was involved with Jihadi operations there. “According to a family members, when he calls home he would talk about Jihad and Independence of Palestine” Shuaib said. The deceased’s sister told Sun Online that Amir had been killed two months ago, though the family themselves only received the news yesterday (December 14). She also denied that Amir held any extremist views. However, local news website CNM quoted Amir’s mother as saying that he was living in Pakistan with his wife and four children (who are still in Pakistan) for higher education. Amir’s family confirmed to CNM that he was visiting Afghanistan when the blast killed him. Maldives Police Service have not yet received any such reports. Foreign Ministry officials were not available for comment at the time of press. Maldives has been hit by a wave of religious extremism in the past few years. In September 2007 a home made IED was set off at popular tourist attraction in capital Male’, injuring 12 tourists. Common threats against voices critical of radical Islamism were actualized with a brutal attempt on a journalist’s life in 2012. Ismail ‘Hilath’ Rasheed came just millimetres from death when assailants he would later allege to be Islamists slashed his throat just yards from his home. This incident happened just a few months after a mob of religious extremists destroyed priceless Buddhist statues in the National Museum. In early 2010, then-Vice President Mohamed Waheed Hassan Manik expressed concern about young Maldivians being recruited by militant groups in Pakistan and Afghanistan to wage ‘jihad’, a claim reiterated by top level officials including former President Mohamed Nasheed. The Maldives secured top spot in their South Asian Football Federation (SAFF) Championship group, playing out a nil-nil draw yesterday in Kathmandhu. With both sides assured of a place in the semi-finals going into yesterday’s game, key players were rested, including the tournament’s top scorer Ali Ashfaq. His contribution to the Maldives impressive goalscoring thus far – 18 goals in two games, with 2 conceded – meant that his side topped the group at the final whistle. The Maldives goalscoring prowess may come back to haunt them, however, as top ranked side India were unable to finish top of their own group, thereby setting up an encounter with their neighbours to the south in the next round. India lost to hosts Nepal on Thursday (September 5), setting up their clash with the Maldives on Monday (September 9), with Nepal facing Afghanistan on Sunday. The Maldives national football team will kick off its South Asian Football Federation Championship (SAFF) campaign against Sri Lanka tonight. Despite the resignation of the Team Manager Ibrahim Amir after a dispute over player discipline during the team’s pre-tournament trip to Thailand, officials are confident that all adversities can become overcome. “I believe it’s a loss to the team if we lose anyone close to the team,” said Assistant Secretary General of the Football Association of Maldives (FAM), Mohamed Nasir. “However, the team is very determined to win despite the situation,” he added. Amir left the team after disagreements with the FAM over the inclusion of two players in the squad. Nasir recommended the suspension of Ismail Easa and Hassan Adham after the pair returned late to the team hotel, but was overruled by the FAM who argued it was too late to replace the two important players. Team captain and all-time leading goalscorer Ali Ashfaq told media today that he felt preparations for this tournament had been better than ever before. “We came here to win the tournament and be with us as the 12th player. Insha Allah we will win the tournament this time, so be with us.” said Ashfaq. The Maldives are the second most successful team in the tournament’s twenty year history, behind six time winners India. The Maldives’ sole victory came in 2008, after they defeated India team who are otherwise unbeaten in the competition since 2005. The Maldives take on neighbours Sri Lanka – kick off 5:45 Maldivian time – in the second of Group B’s games. Afghanistan and Bhutan will play this afternoon. The two sides last met in the semi-finals of the 2009 SAFF championship, with the Maldives claiming an emphatic 5-1 victory in Male’. Group A’s games began on Saturday, with tournament hosts Nepal beating Bangladesh 2-0. This was followed by champions India beating neighbours Pakistan 1-0. Coach Istvan Urbanyi – retained by the FAM for his third SAFF tournament – told media last week that the final group game against Afghanistan (September 6) would be crucial. “No need to talk about options. The first two games we must win, and last game is probably a fight to which position who will qualify, but its better to focus on each game,” Urbanyi told the press. Afghanistan are the highest FIFA-ranked team in the tournament, followed by India and then the Maldives. “We have a good team, but nobody can say that they have the strongest team. Small details will make a difference. We are ready to fight. Our target is to take back the trophy to make fans happy,” said the Hungarian coach. “This is the foundation of Addu’s development,” said Addu’s mayor Abdullah Sodiq, referring to the city’s SAARC preparations during a press conference held in Hithadhoo yesterday. He said the projects had been supported by “99 percent” of Addu residents. Maldivian media was flown to Addu yesterday to observe preparations for the upcoming 17th annual SAARC Summit, scheduled for November 10-12. Festivities will be held in the area starting on the first of the month, in conjunction with the Muslim holiday of Eid. Addu’s SAARC projects have been underway for six months, officials report. As the deadline approaches, construction teams are working round the clock to finish two harbors, a VVIP lounge, roads and the country’s largest convention center. 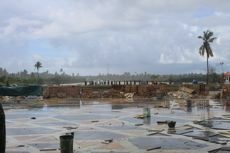 Sodiq said the harbors will renovate Addu’s commercial prospects, while the convention center provides new opportunities for locals, officials and foreigners alike. 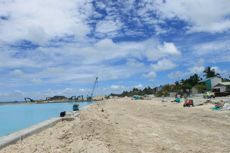 Construction of Feydhoo harbor continues as the first deadline passes and another approaches. “The harbor is a central place for Addu, there is demand for it even after SAARC and we have plans to generate more industry and shipping using these new resources,” said Sodiq. New roads constructed around the convention center have made future road development less expensive for the council’s budget, he added. Addu’s council also plans to use the Rf115 million convention center, a two-story building of glass, wood and marble with a capacity of 3000, to transform the atoll from a quiet place to a hub of business and tourism. Officials and locals interviewed also hinted at hopes for musical events, theatrical performances, art exhibitions and holiday celebrations. Ministry of Tourism, Arts and Culture Assistant Director Ahmed Abeer Ismail said the centre’s origins were a sign of Addu’s potential. “That area began as a swamp, now it’s the biggest convention center in the country.” The swamp was heavily landscaped by MNDF and police forces, and now features a few scenic islands. One of the Maldives’ most strategic atolls, Addu has been largely left to seed since the British withdrew its forces and influence in 1975. City councilor Ahmed Mirzad called SAARC the beginning of a new Addu. “For 30 years we had Gayoom, and nothing was done in Addu. Then there was a new president, and unlike Gayoom he didn’t just look after Male’, he looked after the entire Maldives. For 30 years we didn’t even have one harbor that was working for Addu, but in the past six months, we have gotten everything,” said Mirzad. Addu’s councilors were elected for the first time six months ago. Mirzad said the next three years will be a difficult but critical time for the council to prove itself to Addu’s people. Still, the timing is ideal. “I don’t think, I know that this summit is the right starting point. Now, we will only keep going with our plans to grow,” he said. Workers cross a newly-constructed road to continue landscaping across from the convention center. One particular operation illustrates the grassroots motives behind the SAARC preparations. Selected from Maldives National University (MNU) Addu first-year students in hospitality, 24 Media Liaison Officers greeted Male’s press pack yesterday. One young woman said the event was as much for the liaisons as for Male’ press. “I was shocked to be asked to take part in SAARC, I never thought that I would get to work at something I’d heard so much about,” said another student. “And the certificate of reference that I’ll get afterwards will be really helpful for me when I’m looking for a job after graduation,” she added. Liaisons have just completed a six-month management course and are attending seminars and briefings for SAARC. They will be divided into 11 teams of two to three officers and assigned to press pooles from different countries. “The ministry was going to get people from Male’, but I suggested we use the local energy. They are good, they can do the job, and this is a key event, so why shouldn’t these students take part?” said Abeer. Addu’s development isn’t only tailored to foreigners; Sodiq said part of the development plan is to bring Addu residents home. “Unlike other islands, we have historical places to visit and our islands are connected, so tourists can actually see more than the sun, sand and sea. We will be constructing more lodgings as well, and our hospital and airport are going to be expanded. More business means more jobs, and part of the purpose of all this is to bring Addu citizens back after their migrations to Male’,” he said. In Addu, infrastructure is a priority for community growth. Noting that education was key to development, Sodiq said that a Kangaroo school is scheduled to open next year, and a Billabong school is being considered. For the moment, however, Addu’s mind is on SAARC. With teams working around the clock to complete harbors in Gan and Feydhoo, and MNDF motorcades practicing their moves late into the night, Addu is a bustle of construction and security. Inquiries of Addu’s appearance for SAARC yielded few details. “It’s a secret, we want it to be a surprise,” Faisal and Sodiq concurred. Security, however, is highly detailed. MNDF has delegated security teams to specific event components including media, medical, resort transport, and the airport. “Right now we are very confident in our security personnel and do not anticipate any problems during the SAARC summit,” said International Media Coordinator Ahmed Ibrahim. Ibrahim added that “it will be helpful to have the extra security forces that other countries are providing because Addu is very big.” In addition to ground security, MNDF will be supported by the coast guard, which will establish multiple security layers around Addu’s marine perimeter, special task forces from Sri Lanka, and surveillance equipment from China, among others. Summit guests include three of the world’s most controversial heads of state from India, Pakistan and Afghanistan. Their reputations do not appear to cause anxiety to SAARC officials. “They will not receive any special treatment, unless requested of course,” said MNDF Commander of SAARC Airport Security, Ahmed Shafeeq. Last week, the United States and India concluded the fourth strategic dialogue on Asia-Pacific regional affairs, illustrating the importance that Washington places on its relationship with New Delhi. India’s surging economy has deepened interest among US policymakers eager to advance bilateral ties with a large country in the region that shares a democratic identity. Factors contributing to this shift include China’s ascent as an economic and strategic power and the possibility that the US military may favor an offshore strategy in the future. However, India should not be the sole hope on which US security strategy rests in South Asia. US relations with this new strategic partner are guaranteed to experience bumps, as evidenced by the recent rejection of US firms in the Indian Air Force’s Medium Multi-Role Combat Aircraft (MMRCA) competition. Moreover, India has long maintained a strong non-aligned foreign policy tradition, enforced by policymakers who face continual domestic political pressures not to appear too pro-American. This is not to say that the US-India strategic partnership appears ready to fail. Still, one possible scenario could find relations with India not progressing as quickly as desired, while relations with Pakistan and Afghanistan remain in tatters, leaving minimal US relations with other South Asian states. Even if this scenario does not occur, the United States cannot afford to ignore the need to forge deeper strategic relationships with the smaller countries in the region. Relations with Bangladesh, Sri Lanka, the Maldives and Nepal hold many unexplored possibilities and reasons for expansion. First, as Assistant Secretary of State for South and Central Asia, Robert Blake pointed out in Congressional testimony earlier this year, all these countries are governed by democratically elected leaders. As with the “shared values” discourse supporting greater relations with democratic India, the United States has a similar foundation for fostering ties with these nations. Second, three of these countries are maritime states. Given the importance of securing Indian Ocean sea lanes, through which 50 percent of the world’s container traffic and 70 percent of the world’s crude and oil products transit, it is in US interests to promote maritime security cooperation among South Asian countries and deepen defense ties with these navies as a form of burden-sharing in the Indian Ocean. Further, smaller countries provide better test cases for realizing new strategic visions and more permissive environments in which to experiment than do the larger states of India and Pakistan, where constraints are omnipresent and the stakes are much higher. In the Harvard International Review, Doug Lieb has discussed the importance of analyzing international relations in “marginal states” that are often overlooked in a structural realist worldview that privileges the study of large countries. The smaller countries of South Asia could be easy wins for the United States, especially in the face of increasing Chinese dealings there. US ties are probably the strongest with Bangladesh, a Muslim-majority and democratic nation. Given the country’s vulnerability to nontraditional security threats such as cyclones and earthquakes, the Bangladeshi military would appreciate increased help with weather forecasting technologies and cooperation on humanitarian assistance and disaster relief issues. Before the next environmentally related cataclysm occurs, the United States should further develop security relations with Bangladesh. The Maldives, like Bangladesh, is a relatively pro-American Muslim democracy. It faces the challenge of countering Somali pirates and Lashkar-e-Taiba terrorists from Pakistan seeking harbor on any one of its 26 atolls. The Maldives National Defense Forces would likely not be equipped to handle a potential Mumbai-style attack on its tourism industry and could benefit from US counter-terrorism assistance. US relations with Sri Lanka have been strained due to charges of human rights violations during its defeat of the Liberation Tigers of Tamil Eelam (LTTE) in 2009. Yet as Sri Lanka’s economic and diplomatic ties with China grow, the United States must try not to alienate Sri Lanka given its strategic location in the Indian Ocean. In fact, the US Navy could benefit from exchanges with the Sri Lankan military. For example, learning the swarm attack tactics that were employed during the country’s civil war could help the United States prepare for the threat it may face from Iran in the Strait of Hormuz. In addition, the Sri Lankan navy could benefit from US assistance in transitioning its patrols from the north to the south, where roughly 300 ships pass the tip of the island daily. Regarding Nepal as it draws down its forces and integrates Maoist rebels into the military as part of its peace process, US security cooperation and expertise could be critical in this operation. Finally, judicial capacity-building would be another low-cost way to advance US ties with all these countries. By comparison, China has been strengthening its ties to South Asian countries, especially in the form of infrastructure development. Chinese port construction in Chittagong, Bangladesh; Hambantota, Sri Lanka; Gwadar, Pakistan; and Kyaukpyu, Burma have all been cited as prominent examples of a supposed “string of pearls” that China may be seeking to build in an area outside its traditional sphere of influence. Regardless of actual Chinese intentions in South Asia, Indian analysts have voiced concern about being “encircled” by China’s economic, military, and diplomatic inroads with these countries, including Nepal. In recognition of the growing challenges South Asia presents to the United States, experts are beginning to discuss ways of reorganizing the US government’s bureaucracy to address the region’s new realities. Bruce Riedel and Stephen Cohen have proposed the creation of a “South Asia Command” (SACOM) to overcome the seam issues posed by Pacific Command (PACOM) and Central Command (CENTCOM) separating India and Pakistan in US defense policy. Others have suggested an Indian Ocean Region Command (IORCOM). With such talk and broader discussions about a realignment of US force posture in Asia, now is the time to also examine relations with the smaller countries in South Asia and the prospects for building partner capacities in the region. As the United States winds down its commitment in Afghanistan, while confronting unbounded uncertainty in its relationship with Pakistan, it can look to the promise of partnership with India only to a certain extent. If disappointments such as the MMRCA rejection happen too often, or if India tests nuclear weapons again and Washington re-imposes sanctions, the United States would be left without strong security partners in the region. For too long, the United States has ignored the potential benefits of fostering relations with the smaller countries in South Asia. Prospects for advancing US security ties with Bangladesh, Sri Lanka, the Maldives and Nepal deserve serious examination. Nilanthi Samaranayake is an analyst in the Strategic Studies division at the Center for Naval Analyses in Alexandria, Virginia. Recently-released Wikileaks cables reveal that the Maldivian government in 2004 assured the United States that former Guantanamo prisoner Ibrahim Fauzee would not be able to leave the Maldives. Fauzee was then sent to Afghanistan, where he was handed over to US forces. According to a US Department of Defense file published by UK’s The Telegraph, Fauzee was identified as a “medium threat to the US, its interests, and its allies” when he arrived at Guantanamo Bay prison in Cuba on August 5 2002. According to the cables, Maldivian Permanent Secretary Ahmed Shaheed requested that the United States share any intelligence it had gained from Fauzee on 5 November 2002. The cable noted that the Maldivian government “may have made similar requests via other channels”, but there is no evidence of any response to these requests. Eighteen days later, cables show that Shaheed wrote to US officials requesting Fauzee’s release. By August 2003, Maldivian government personnel were granted a visit to Guantanamo and an interview with Fauzee. The government’s assessment found Fauzee an unlikely threat, and after further investigation the Maldivian government requested his release on 5 November 2003. No action was taken, although cables indicate at least one more request for Fauzee’s return was made on 11 May 2004. By late 2004, the US government had agreed to return Fauzee to the Maldives under certain conditions. A cable dated 13 December of that year shows the Maldivian Foreign Ministry was interested in cooperating with these conditions, which included humane treatment upon release. On the same date, the US Combatant Status Review Board offered Fauzee a chance to contest his status as an enemy combatant. Three and a half months later, the US government determined Fauzee “to no longer be an enemy combatant.” Fauzee was extradited to the Maldives on 11 March 2005, where he is currently president of local religious NGO, the Islamic Foundation. Fauzee is the only Maldivian on record to be detained at Guantanamo Bay. After his release from Guantanamo, Fauzee discovered that his vital documents, which Pakistani authorities had seized during his arrest in 2002, were not in his possession. Since May 2005, the Maldivian government and Human Rights Commission have requested their return from the US government. Fauzee told Minivan News today that his documents were returned to him, but declined to comment on the release of the Wikileaks cables. The cables were released on Friday, September 2 along with tens of thousands from countries with which the US has difficult relationships, including Afghanistan, Pakistan and Iran. Files on Guantanamo prisoners were among those released. Since the release, the Wikileaks website has crashed repeatedly due to high traffic. Afghanistan has seen its worst violence in months after almost 20 people were killed over the weekend in protests over the burning of the Quran by fundamentalist US pastor Terry Jones. The dead included seven staff at a UN mission in the normally quiet city of Mazar-i-Sharif, who were killed on Friday when several thousand demonstrators stormed the compound after prayers. Four Nepalese guards at the entrance were killed while three Europeans from Sweden, Romania and Norway were shot after unsuccessfully attempting to barricade themselves in a secure room. Reports in the UK press claimed that two of the victims were also beheaded, while the third had his throat cut. AFP meanwhile reported that the Russian head of the UN office survived by speaking in the local dialect and pretending to be Muslim. Ten protesters were killed in a demonstration the following day in Kandahar, and 53 were injured. Speaking to Reuters, Taliban spokesman Zabihullah Mujahid denied that the insurgents were involved in the attack on the UN. Jones, who leads a small congregation in Florida, became the centre of a global media storm in September 2010 after threatening to burn the Quran in opposition to plans to construct an Islamic centre near the former site of the World Trade Centre. He was eventually persuaded to refrain from burning the Quran after phone calls from the US State Department, and US Defence Secretary Robert Gates. However on March 20, 2010, receiving little attention from the US media, Jones proceeded with the burning and uploaded the footage to the Internet, with Arabic subtitles. News of the burning later erupted across Afghanistan after President Hamid Karzai condemned Jones’ burning of the Quran ahead of Friday prayers. The US is already grappling with the fallout of a recent article in Rolling Stone magazine and German newspaper Der Spiegel, concerning a rogue army unit in Afghanistan accused of killing three Afghan civilians for sport and cutting off their fingers as trophies. Five soldiers have been charged with murder and are being tried in a military court. The UN’s Envoy to Afghanisatan, Staffan de Mistura, described the burning as an “insane and totally despicable gesture”. The Washington Post meanwhile reported that in the wake of publicity surrounding the Quran burning Jones’ had been ostracised by his community, his congregation and income had plummeted, and both his Internet service provider and insurance company had cancelled their services.